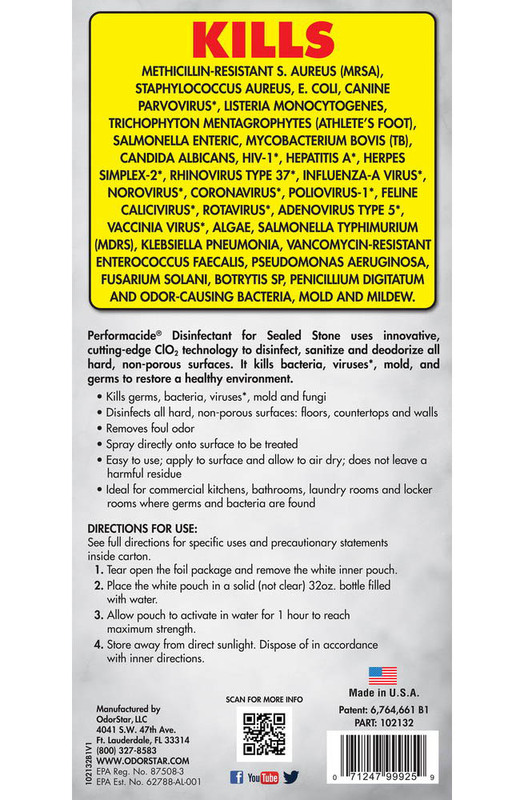 PERFORMACIDE® Hard Surface Disinfectant is for use on hard, non-porous surfaces as a Disinfectant, Sanitizer, Tuberculocide, Virucide*, Fungicide, Algaecide, Slimicide, and Deodorizer. 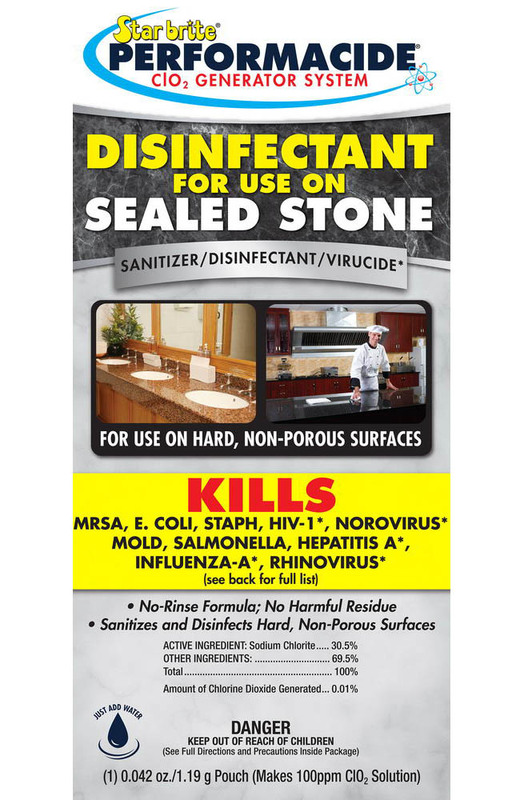 As a disinfectant PERFORMACIDE® kills MRSA, Staphylcoccus aureus, Listeria, Trichophyton mentagrophytes (athletes foot), Enterococcus faecilis, Salmonella, TB. 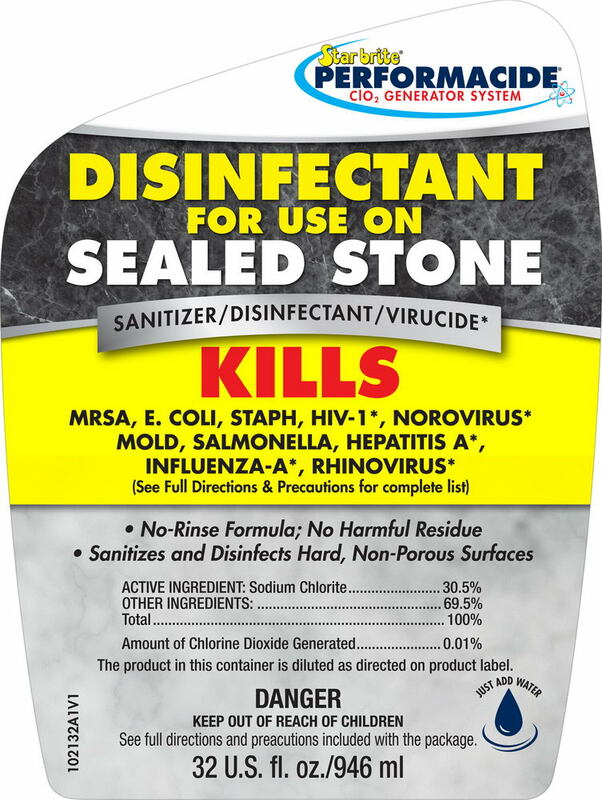 As a virucide, PERFORMACIDE® kills HIV-1, Hepatitus A, Herpes Simplex-2, Rhinovirus, Influenza-A, Coronavirus, Norovirus, Poliovirus*, Adenovirus, Rhinovirus, Canine Parvovirus, feline calicivirus, and Vaccinia virus. 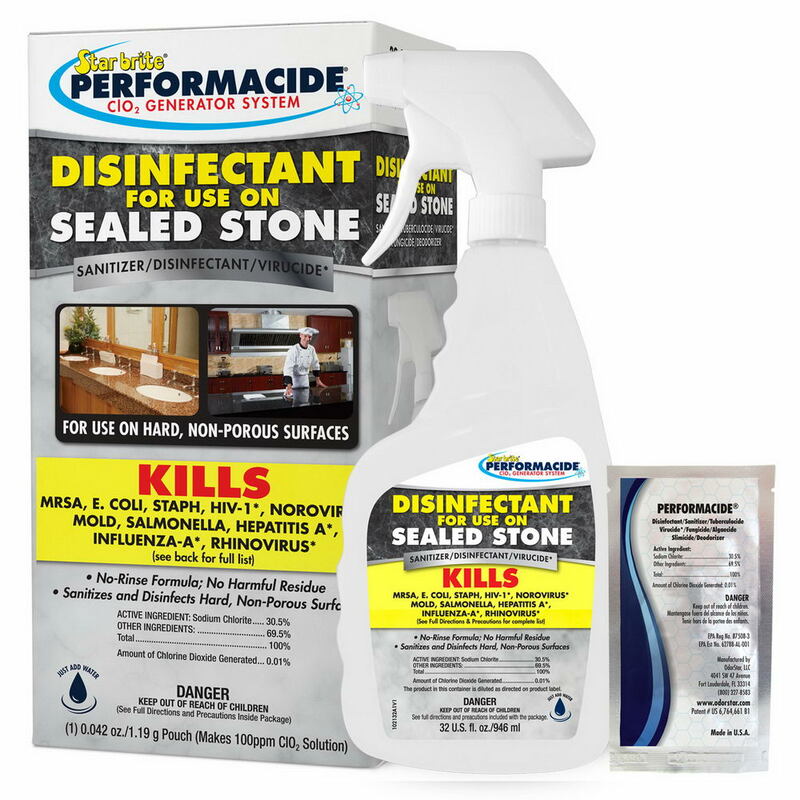 PERFORMACIDE® kills odor causing bacteria mold & mildew. PERFORMACIDE® EPA Reg. No. 87508-3 is registered for use in hospitals, medical laboratories, rehabilitation facilities, diagnostic centers, clinics, first responder facilities, and equipment, veterinary hospitals, medical equipment, pharmaceutical facilities, and laboratories. PERFORMACIDE® uses a pre-measured pouch that when immersed in the corresponding amount of water creates a 100 ppm chlorine dioxide solution. Allow the pouch 60 minutes to reach full activation, and the 100 ppm ClO2 solution lasts 15 days when stored in an oxidation-proof, dark closed or sealed container in a cool dark location. 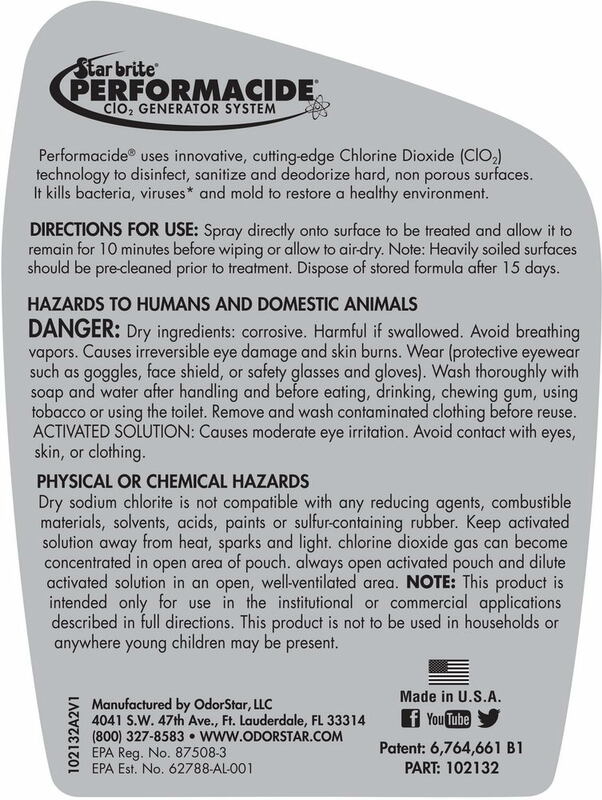 Using EPA label directions, PERFORMACIDE® can be diluted to 20 ppm for use as a sanitizer on non-food contact surfaces, and 5 ppm for use as a sanitizer on food contact surfaces. For disinfecting, wet the area to be treated with a mop, sponge, or pressurized tank sprayer and allow to air dry. This product can be applied to walls, floors, furniture, stainless steel, glass, vinyl, or other hard non-porous surfaces. For sanitizing hard non-porous, food contact surfaces dilute to 5 ppm and allow 5 minutes of exposure time. 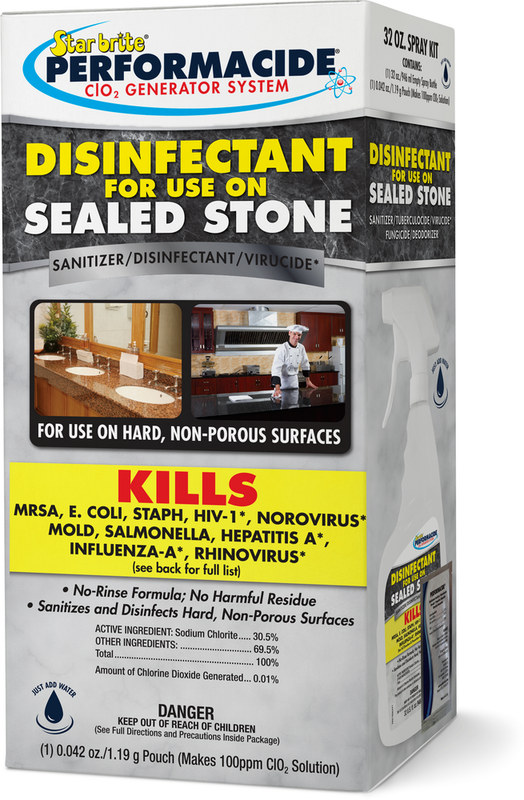 For sanitizing hard non-porous, non-food contact surfaces dilute solution to 20 ppm and allow 5 minutes of exposure time. Please see inner label instructions for dilution tables and ratios. To test activated solutions after storage or dilution use chlorine dioxide test strips for concentrations with a range of 0 ppm up to 500 ppm. Add pouch to pre-measured amounts of water, and allow 60 minutes for full activation of ClO2 solution. One 1.19 gram pouch to each 32 oz. bottle and fill with water. Unused product can be stored for up to 15 days. Wet area with mop, sprayer, sponge, or pressurized tank sprayer and allow to air dry. This product can be applied to walls, floors, furniture, stainless steel, glass, vinyl, or other hard non-porous surfaces. Applications include hospitals, medical facilities, veterinary hospitals & kennels, public areas, first responder facilities and equipment, clinics, rehabilitation facilities, diagnostic centers, food processing and serving facilities & beverage bottling facilities, gymnasiums, hotel/motel rooms, bar tops. May be used on previously cleaned food preparation surfaces: fountain drink and beverage dispensers; glassware, plates, and eating utensils and food and beverage processing equipment at a dilution ratio of 5 ppm and an exposure time of 5 minutes. Effective food contact surface sanitizer at an exposure time of 1 minute at a dillution of 5 ppm against E coli, Staphycoccus aurea and Salmonella typhimurium. May be used to sanitize and disinfect non-food contact surfaces at a dilution rate of 20 ppm and an exposure time of 5 minutes. This product can be applied to walls, floors, furniture, stainless steel, glass, vinyl, and equipment.